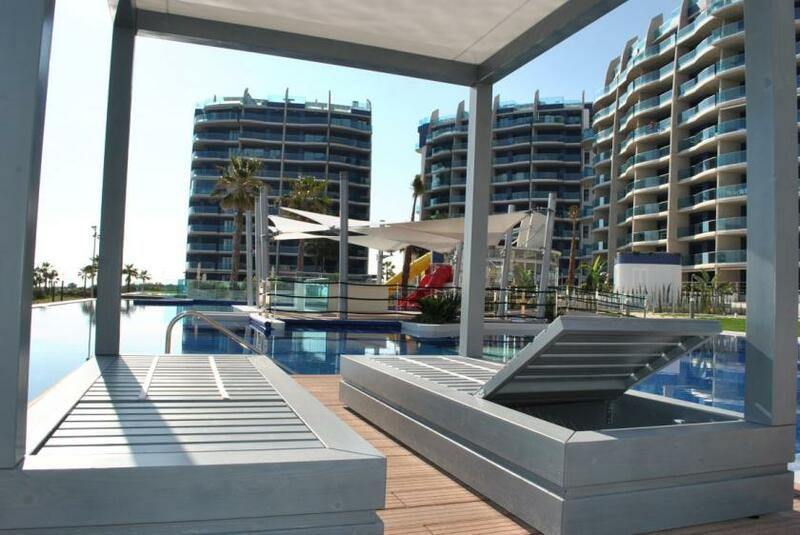 Frontline apartment with Unbeatable Sea Views, excellent finishes and spacious communal areas equipped with all the luxuries. From the balcony ( 17m2 on the 4th. 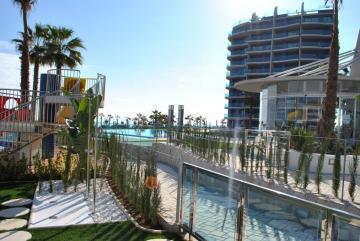 floor ) you can also enjoy beautiful views to the communal areas, the swimming-pools and promenade, the natural park of Cala Ferris and even the port and city of Torrevieja. 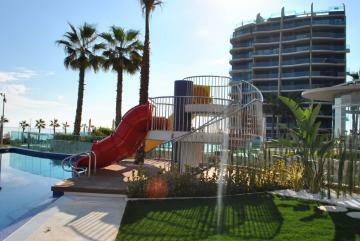 The apartment has a large living room furnished with dining table, leather sofas, two bedrooms with 1 x 2 + 2 x 1 sleeps. There is a LCD TV on the masterbedroom, 2 bathrooms with walk in shower + shower facility, air conditioning, LCD TV with international channels and WIFI. The open kitchen is fully equipped with the necessary facilities, such as as dishwasher. There is also hot-water heating which ensures a comfortable indoor climate in the winter months. Enjoy the infinity type pools overlooking the Mediterranean which one is heated, have a relaxing soak on the water beds or in one of the various heated Jacuzzis. 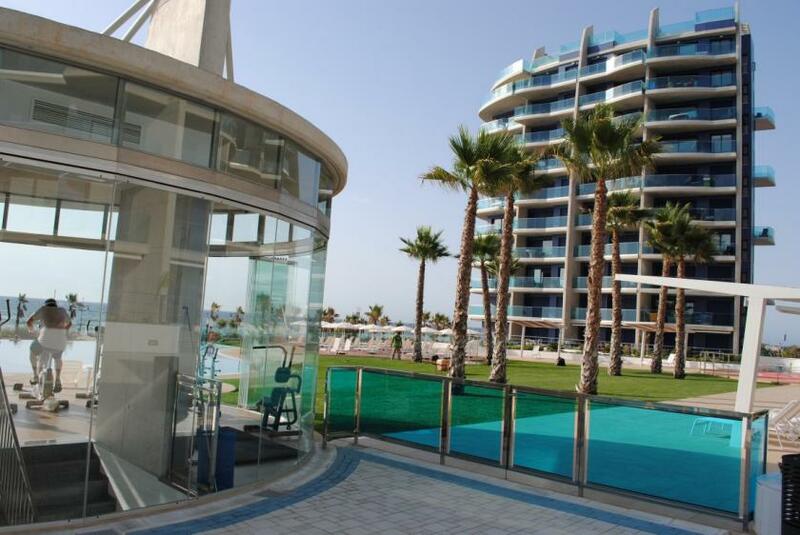 You can stay in shape with various sports courts catering for paddle tennis, football or basketball, or workout at the fantastic gym with its glass front allowing for panoramic sea views. Feel the benefit of a wellness session in the Turkish baths or Finnish saunas, or simply enjoy the sun from the sun loungers or Bali-style beds. 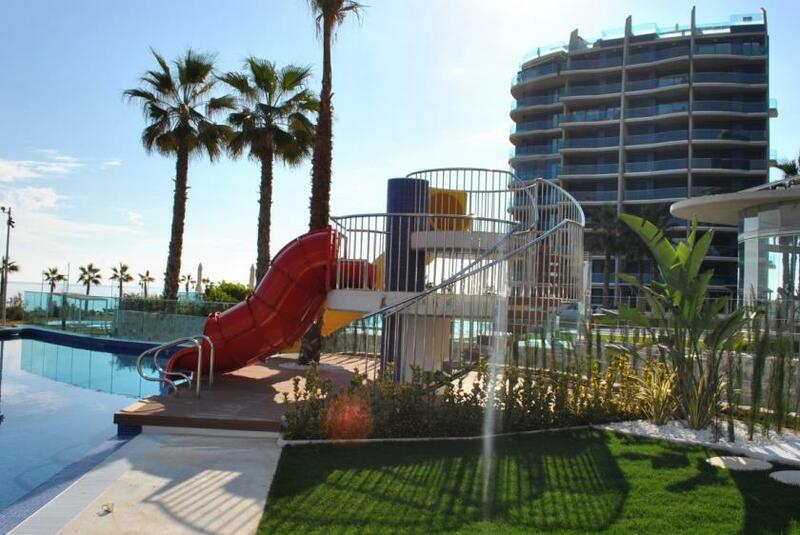 The little ones will also have a great time in the swimming pools, one of those with a slide, and the various children’s play areas, water jets, kids’ castle and ping pong tables. Parking is possible in the underground garage. Have you ever considered staying here in the winter? is without any doubt the most popular destination for northern Europeans to winter. It suits all people whether they are young, old, healthy or sick. There is a place under the sun for everyone. This region has the perfect climate thanks to its location, making it ideal for wintering! Prices certainly won't hold you back - take advantage of our reduced rates! From €275,- per week within costs of energy and use of the Internet. 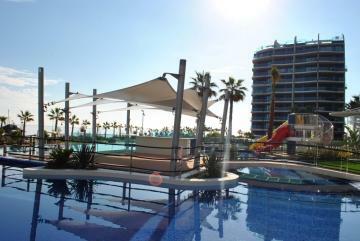 This low price is valid for a minimum rental period of four weeks and only from November till April. Punta Prima is situated a ten minute drive just south of Torrevieja, and all of its amenities such as the shopping complex, Las Habaneras, Waterpark, Pacha nightclub, casino, ten pin bowling, marina, submarine, boat trips, and Playa Flamenca with its beautiful beaches. 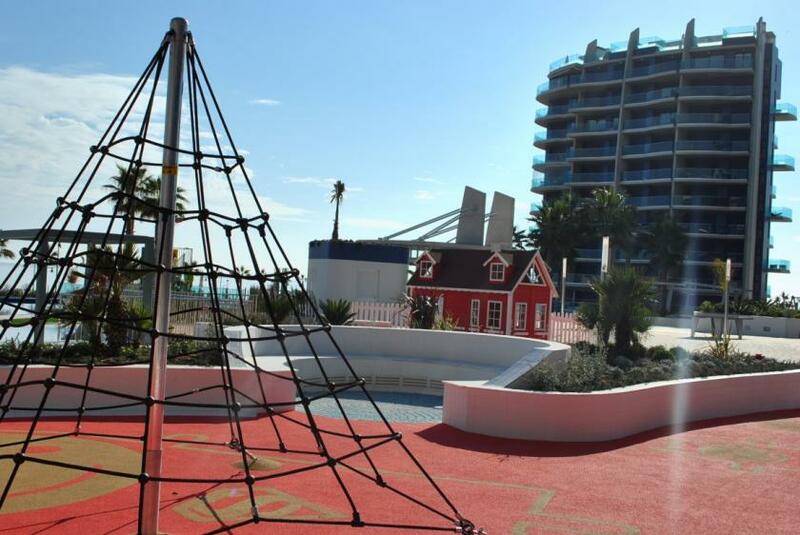 For those more energetic you can reach Torrevieja by foot, a mere thirty minute stroll along the coast or there is an hourly bus service to take you there. Go-Karting is a must when visiting Punta Prima with a visit to the Asturia Restaurant to follow, a very large Resaurant with English speaking staff. The food is of a very high quality especially the many different paellas, with good value for money. Free car park with Mediterranean views. Punta Prima also has a Commercial Centre with an Eroski supermarket, Wok Buffet (Chinese) restaurant, Captain’s Table restaurant ( fish and chips, Sunday roasts and breakfasts ), Amigos bar, Chinese restaurant, Greta Garbos restaurant is a Swedish restaurant open in the evenings only, Subway, Timeless fashions with English clothes, Milar, Druni, The Card Place, Nautilus Plaza with American style hamburgers and ice creams, Yu Chinese restaurant is quite fancy, Murphy’s Irish Pub and cafe and Emilio’s Italian restuarant and take away.